Poor Zoey! She’s so likeable and endearing that I couldn’t help but feel for her from the first few pages and yet her “in-control side” (with her business) made her entirely realistic. Not many of us can say that we’ve never felt the urge to find out what an ex is up to, to see how his life is now and to find out if he regrets the break up. Zoey is completely honest (with herself) that the things she’s done are perhaps not entirely above board but her heart is broken and she can’t seem to move past the hurdle and let go. While I felt synergy with Zoey, her friends and her aunt I did have a hard time falling for the likelihood of the plot. Perhaps I’m being nitpicky but I felt it truly astonishing that someone who had their head entirely screwed on straight in their business would find themselves so utterly swept up in the romance of a beach setting to get themselves a new beau so quickly. Am I being a prude? Likely. And it’s possible that I’m fixating on the early part of the novel and not what subsequently occurs back in reality. I liked what happened after their return to life and I whole heartedly agreed with the turn the novel took- which is good because I feel that Lavoie has a great knack for creating characters women can relate to. 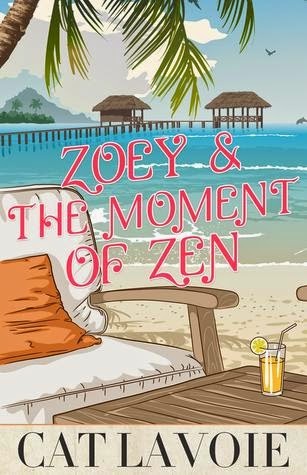 Cat Lavoie made me believe in the environment and Zoey and the Moment of Zen had me desperate for sand, sun and all inclusive vacations and it is only fall! This novel is quick and breezy and definitely a book you will rush through so you can find out how Zoey ends up moving on. Thank you to ChickLitPlus for our review copy. All opinions are our own.